Who: Call to Arms Brewing Company invites you to join them for the craziest Halloween party in Denver. Blending tradition with innovation, Call to Arms is a gathering place passionately committed to quality, community, and camaraderie. What: Like all of Call to Arms’ Rumpus spectaculars, the Halloween Rumpus guarantees good old fashioned fun paired with a unique and creepy twist. Inspired by the cheesy horror flicks of the 1980s, this festive throwback party will be sure to delight. Enjoy live t-shirt screen printing by Humble Monster featuring a custom limited-edition Call to Arms Halloween design by Jake Rathkamp of The Graphite Club, a special fall-inspired menu from MAS KAOS Pizzeria & Taqueria, specialty beer releases including a Halloween-inspired beer punch, spooky cookie creations from Valhalla Cakes, and 80s-inspired DJ set by Nightlove. When: Saturday October 27 from 12:00-11:00 p.m. Live screen printing available from 12:00-5:00 p.m. and DJ set from 6:00-9:00 p.m. Costume Contest at 7:30pm. Why: Halloween Rumpus is a fun throwback party that celebrates the underrated and golden era of 1980s horror film. So bring on the cheese and dress to impress, the most creative, wild and crazy Halloween costumes will win prizes. 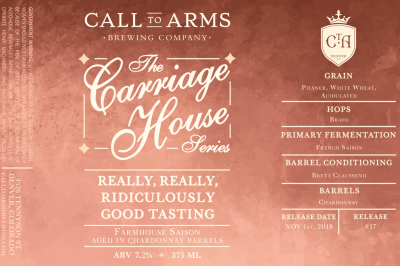 About Call to Arms Brewing Founded in 2015, Call to Arms Brewing Company is located in the Berkeley neighborhood of northwest Denver, Colorado. Blending tradition with innovation, the brewery is a gathering place passionately committed to quality, community, and camaraderie. 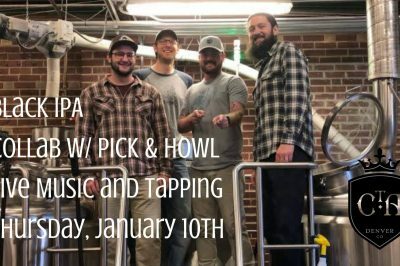 For more information visit calltoarmsbrewing.com. Call to Arms has relaunched their Community Supported Artisans program. 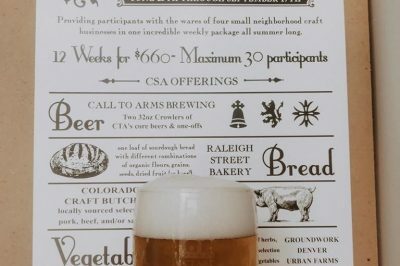 Starting June 25, participants will enjoy wares from four neighborhood craft businesses in one weekly package.